This is described graphically in Figure 70.8. 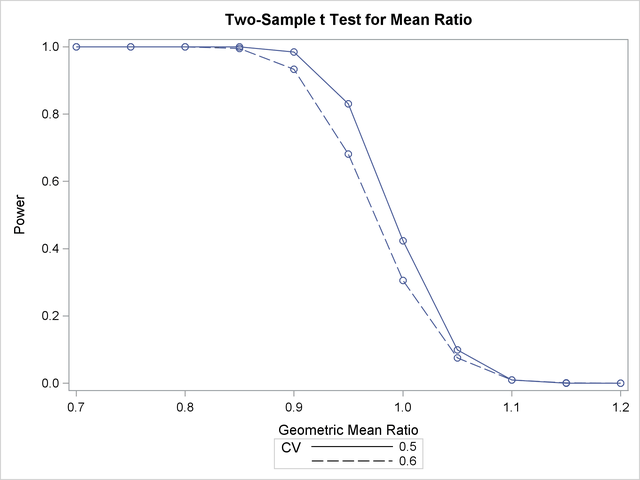 Mean ratios below 100% are better levels for the new process; a ratio of 100% indicates absolute equivalence; ratios of 100–110% are "tolerably" worse; and ratios exceeding 110% are appreciably worse. Output 70.4.1 and Output 70.4.2 show the results. The "Computed Power" table in Output 70.4.1 shows that power exceeds 0.90 if the true mean ratio is 90% or less, as surmised. But power is unacceptably low (0.31–0.42) if the processes happen to be truly equivalent. Note that the power is identical to the alpha level (0.01) if the true mean ratio is 1.10 and below 0.01 if the true mean ratio is appreciably worse (>110%). In Output 70.4.2, the line style identifies the coefficient of variation. The plotting symbols identify locations of actual computed powers; the curves are linear interpolations of these points.